USAir Flight 427 crashed while on approach to Pittsburgh International Airport following a loss of control and airplane stall precipitated by an encounter with the wake of a preceding Boeing Model 727 airplane. The National Transportation Safety Board deemed that the loss of control was caused by a full rudder deflection in a direction opposite to that commanded by the flightcrew (rudder reversal) in response to the wake encounter. During the upset, the elevator was commanded by the flightcrew to its full-up position, resulting in an airplane stall, further compounding the loss of control. Control was never regained. The airplane crashed approximately six miles northwest of the airport, killing all 132 passengers and crewmembers. 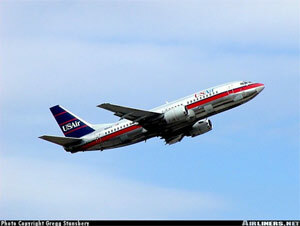 Subsequent to the accident, the Model 737 rudder system was redesigned to preclude an in-flight reversal. In addition, a training document, the Upset Recovery Training Aid, was produced by an industry team to aid in the development of training for recovery from in-flight upsets.